Flooding, high ground water, improper drainage and severe weather can cause water related damage to building floors, walls, HVAC systems, insulation, structural wood, foundations and more. Waiting to fix the root of the problems often leads to greater damage – and is not advised. Often times, the best solution involves the installation of a perimeter drain system in, or around, your home. 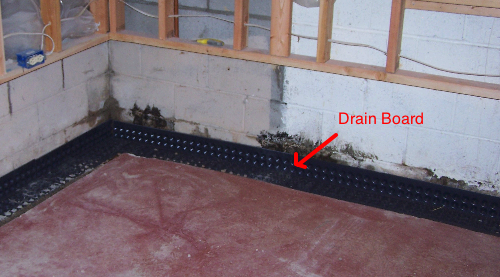 Montana Basement Solutions has installed hundreds of interior drain systems, along with numerous exterior perimeter drain systems over the years. In most cases, we recommend interior systems – particularly in existing homes and in those new homes where the topography is advantageous (hillside) to gravity draining. How does a perimeter drain work? 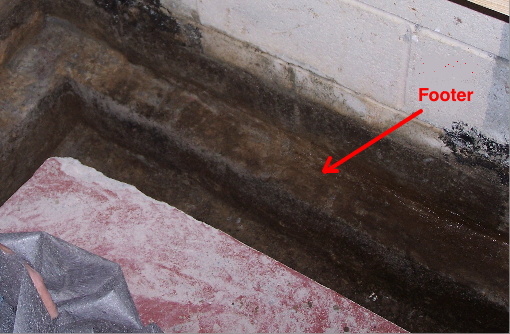 Water is typically entering your basement or crawlspace around the footer/wall/floor area, as this is where the concrete seams meet, and a path for water to enter is found. As ground water saturates the area around and under your home (especially in the spring thaw) – water looks for places to go. That constant pressure of ground water pushing up under your floor, and down along and through your walls eventually results in unwanted water in your home. A perimeter drain system, make no mistake, is the only way to effectively and permanently remedy this problem – without tearing up all of the ground around your home. With a properly installed perimeter drains system installed, and a quality sump system (properly maintained) attached, your basement or crawlspace can be kept dry for as long as you own your home. This allows you to utilize you basement as intended or desired: remodel, add living space, store household goods, and more. All this, and the knowledge that you are no longer at risk of mold, water damage, foundation concerns or other potentially even more dangerous and costly concerns. 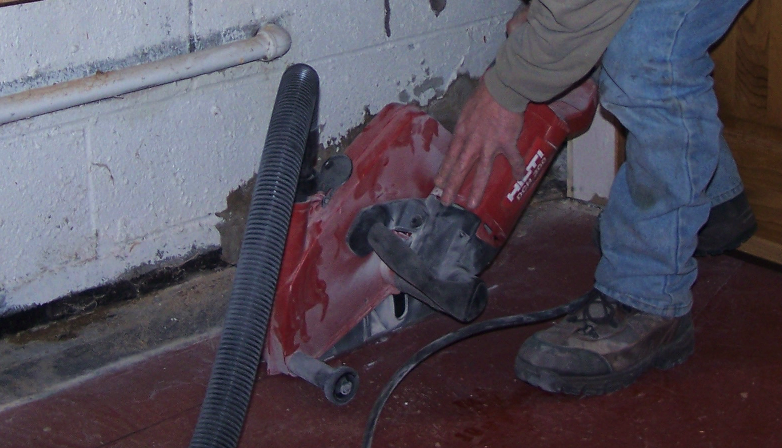 Step 1: Technicians cover all floor and wall areas necessary to protect your home from our process. This may include carpet or said floor barriers, wall coverings, temporary plastic walls, exhaust fans, air filtration systems, lawn tarps, protective shielding for home exterior surfaces,and more. 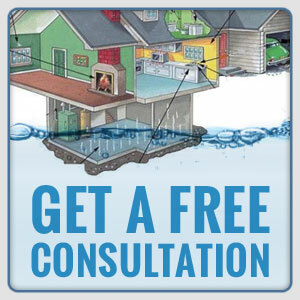 Our goal is to leave your home or property as we found it – and that means advance preparation to prevent any damage. Step 2: The Cut – Technicians carefully cut out the perimeter of the slab per the design, and remove/dispose of the concrete and some soil underneath. This forms the channel for our drain to be installed – eventually routing all troublesome water to our sump basin and pump safely. Step 3: Clearing the Drain Area: Once cut, technicians remove the concrete and excess earth to reveal the footer and the area immediately along side the footer. This is the area where we install our drain line – catching and channeling any rising water below the footer and slab, and safely directing it to our sump system. All of this material is carefully removed from your home and disposed of by our crew. Note: Some competitors only set their drain on top of the footer – thus only catching water along once it is already at slab height. 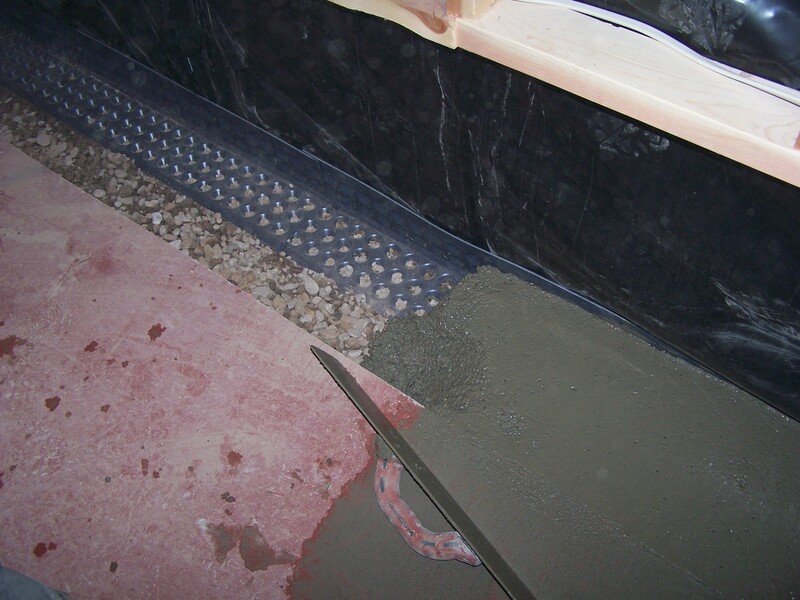 While these lesser systems may catch water along the seams, they can fail to lower ground water that is coming up from underneath the slab and entering the basement through cracks and seams. Step 4: Drain Line & Drainboard Installation: Our perforated drain line and drainboard are installed, along with drain rock lining next to the footer. These, when properly installed as designed by the MBS sales team, allow for practice water management under the slab, footer, and cold seam – ensuring that your basement is dry year round…guaranteed. 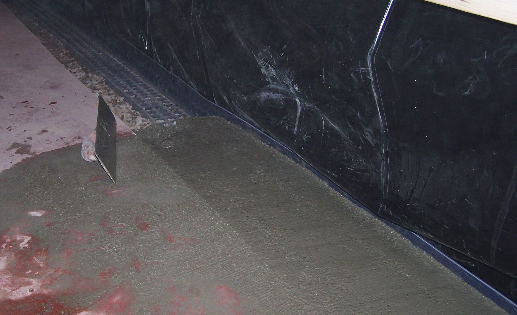 Step 5: Concrete Floor Finishing: Oncer our drain and sump basin are in place, we finish off the floor with fresh concrete. Final troweling leaves a floor finish that can be tiled, carpeted, or ready for a number or other concrete floor finishes. Many customers finish their basement off with drywall walls and turn previously unfinished basement storage space into a finished, useful addition to their home. 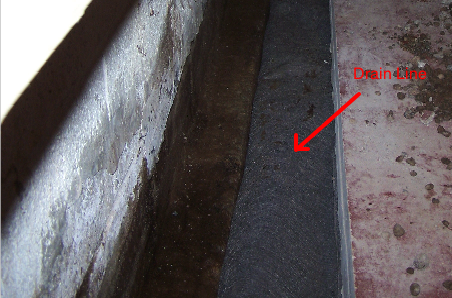 Call us today for more information or a FREE quote on a interior drain system in your basement or crawlspace. There is no reason to put up with unwanted water in your home any more.